We are a family owned and operated business proudly serving the community for more than 50 years. Our qualified team is here to make your shopping experience pleasant and convenient. From left to right: John Coffee, Doug, Linda, Lynn, Dave, Everett (now happily retired) and Steve. 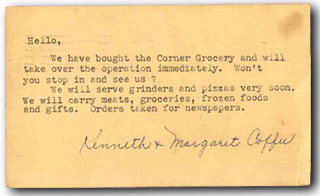 Original post card mailed out to the community in February 1958 asking neighbors to "stop in and see us"
In 1958 Kenneth and Margaret Coffee purchased the "Corner Grocery" from Earle G. Morgan. The property existed of a gas station, a variety store, gift shop, lunch counter, and soda fountain, as well as a six room apartment. The property was acquired by Mr and Mrs Morgan in 1938 from the late Cora Huntly. Standing on the property was a house 200 years old which was disassembled and taken to New York to be rebuilt. 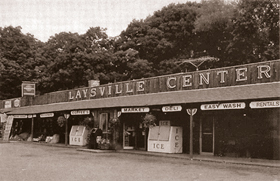 In 2003 brothers John and Hugh Coffee decided to give the family owned and run Laysville Center a facelift. 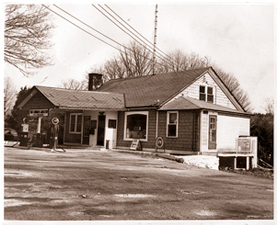 The store was taken down to it's foundation and rebuilt to what you see now. Ken Coffee Jr. does a great job outlining the evolution of Laysville Center on the Coffees Country Market & Catering website.